Here at Sunrise Signs, we thought we’d have some fun with March Madness. 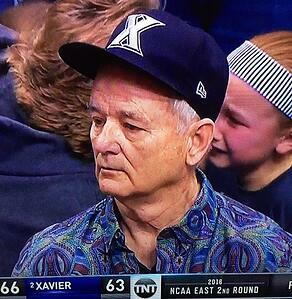 Oh, the excitement, the disappointment, and Bill Murray’s sad face after Xavier lost to Wisconsin! Stop the madness! But look at things on the bright side. If you have Syracuse (10 seed) to win it all, you just might want to buy a lottery ticket. 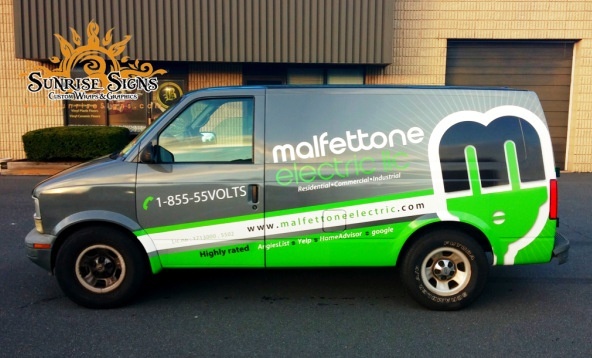 In business for over 30 years, the electrical contractor Malfettone does it all and specializes in Briggs and Stratton generators. Can't you feel the "green energy" from these van wraps? 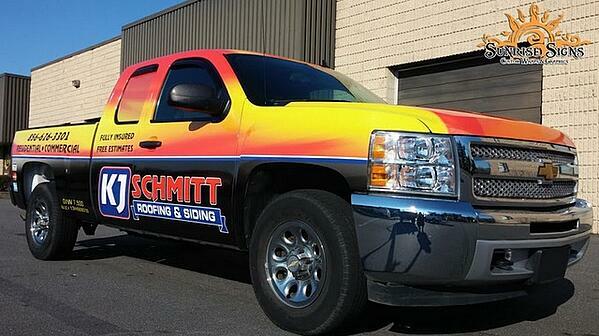 Located in Pine Hill, NJ, KJ Schmitt is a roofing and siding contractor. Very often simple straight lines with bright colors are all you need to brand on wheels. Now in over a dozen cities, You've Got Maids is a widely successful cleaning contractor. With franchises everywhere, we happily wrapped an Elantra for their Cherry Hill, NJ location. The design of these Tundra truck wraps was a no-brainer. 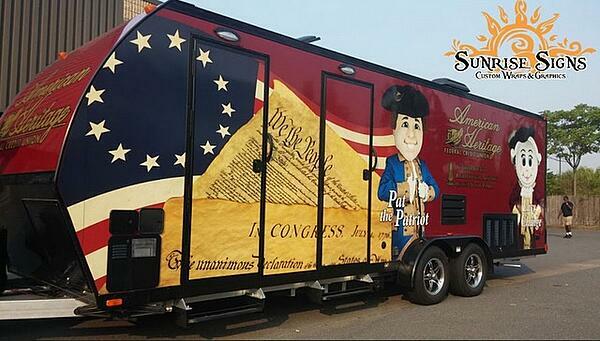 America Asphalt Solutions shows off their pride and "trust" with patriotic flag wraps that really stand out! 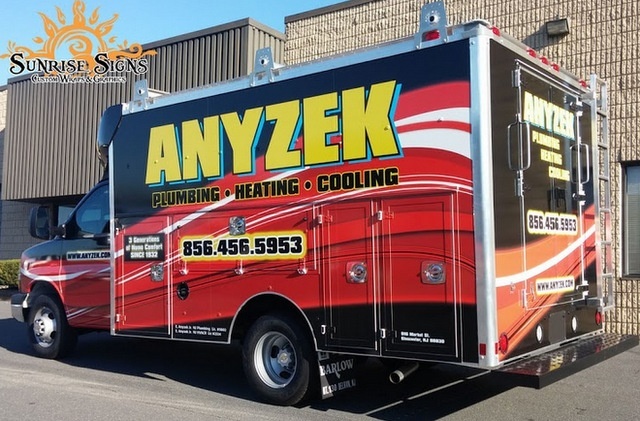 Located in Gloucester City, Anyzek HVAC has been serving the South Jersey area since 1932. 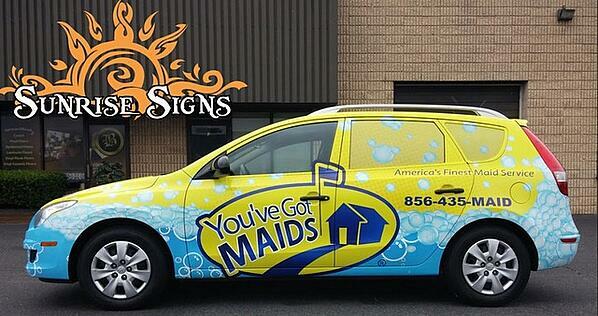 Even well-known, established business benefit from vehicle graphics to reinforce their brand identity. Located in Philadelphia, American Heritage Credit Union proudly shows off the City's imagery in their trailer wraps. This wrap did indeed draw plenty of positive attention! 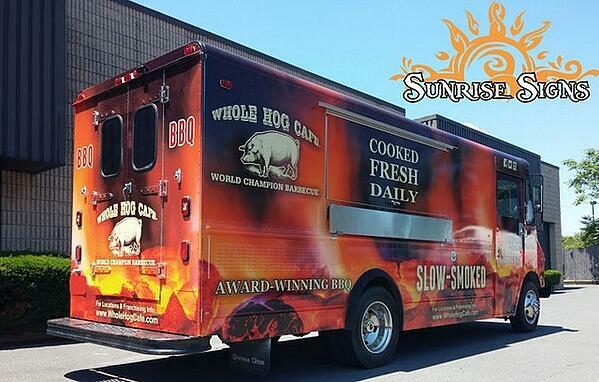 In South Jersey, the Whole Hog Cafe is famous for their BBQ! Headquartered in Little Rock Arkansas, their Cherry Hill, NJ location needed a food truck wrap to bring their food to the masses. 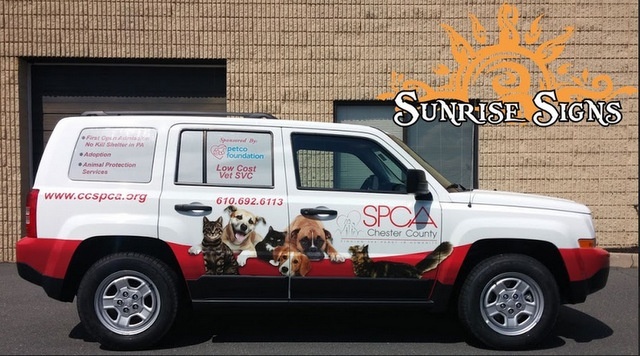 To promote their "puppy program" Sunrise Signs stepped in and designed Jeep Patriot SUV Wraps for the Chester County SPCA. Happy to supply inexpensive veterinary services, they serve all of Chester County PA. Serving Pennsylvania, New Jersey, Delaware and New York, Premier Window Cleaning wanted simple truck graphics that still conveyed their services. Luckily, our designers came up with the perfect design boosted with truck lettering. 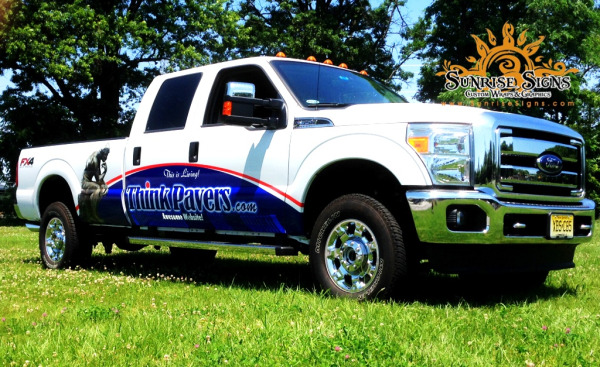 With over 20 years of experience, Think Pavers has been “Helping customers across the tri-state area bring beauty, functionality and ambiance to their outdoor living environments with expert hardscape installations.” We were excited to add truck graphics to five of their Ford F150s. 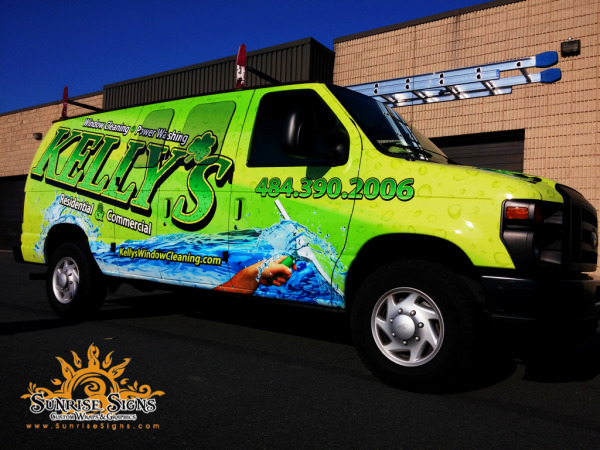 Kelly's Window Cleaning serves areas within a 90-mile radius of their home base of Glassboro, NJ. A splash of blue against a backdrop of green boosts their brand while out on the road serving their customers. 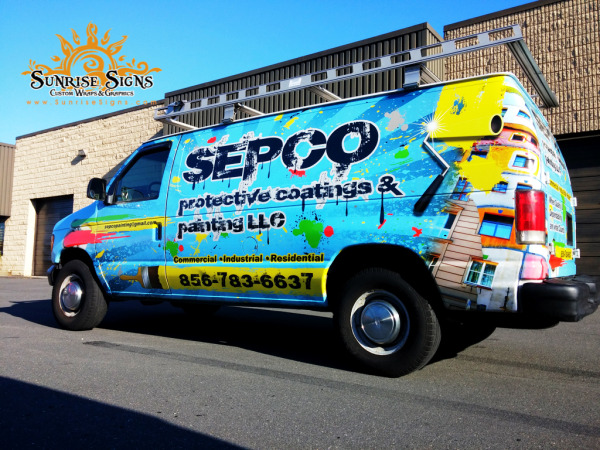 Licensed in both Pennsylvania and New Jersey Sepco Protective Coatings and Painting came to Sunrise Signs with 3 Ford F250 vans and we jumped on this vehicle wrap project. Design approved to help this business step out into the market. 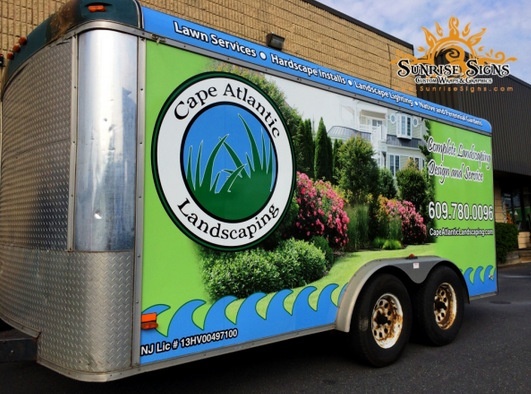 While general lawn maintenance is one of their services, Cape Atlantic Landscaping also offers help with specialty gardens like herb and flower gardens, pruning, ponds, gazebos, patios and more. This wrapped trailer shows off images of what they can do for their customers. 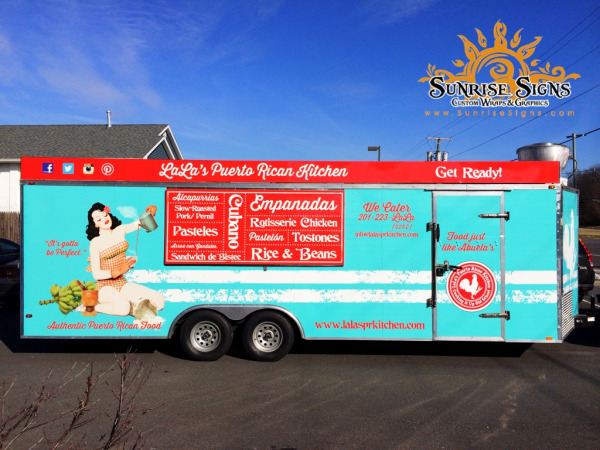 The mobile eatery of LaLa's Puerto Rican Kitchen feeds many at its location on 3854 Highway 9 South in Old Bridge, NJ and they have an eat-in restaurant in Union City, NJ. These colorful trailer wraps show off their favorite dishes and their culture. 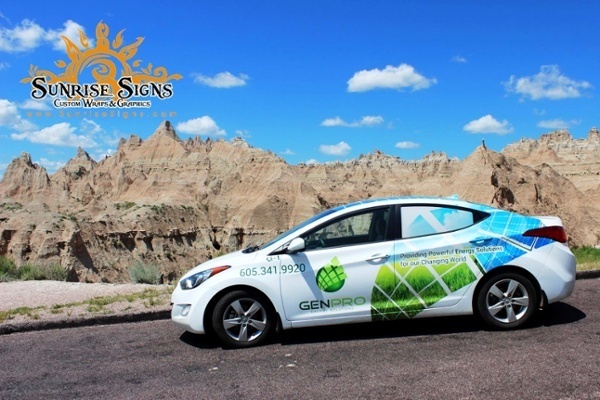 Located in Piedmont, SD, GenPro Energy Solutions asked us to design fleet vehicle wraps for 4 Chevy Silverado trucks, a Hyundai Elantra, a Volkswagen Jetta and two tow-behind trailers. We even flew our team of expert installers out to South Dakota to ensure the job was done to perfection! 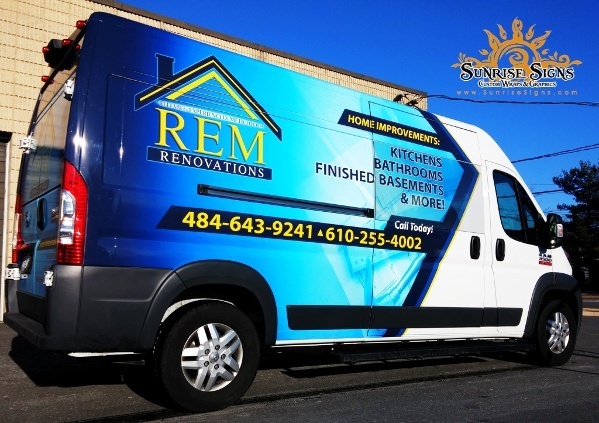 Able to handle home renovations both large and small, REM Renovations asked us to wrap one of our favorite vehicles, the RAM ProMaster van! The house above their logo is a nice touch showing viewers exactly what they do. So that's our lineup for March Madness! We hope you enjoyed just 16 of our favorite projects. It's hard to come up with only 16 because we have wrapped so many types of vehicles for all sorts of clients. Need a vehicle wrap or a fleet wrapped? We're here to help!